We must be reaching Welles saturation point this year. Mark Cousins’ The Eyes of Orson Welles landed on the piles of Wellesaphilia, soon to be joined by Morgan Neville’s They’ll Love Me When I’m Dead. Restorations of all his major works are either accomplished or in the works. Now, an almost legendary project – shot over a span of years, completed, not-completed and swamped by a deluge of legal woes from dodgy financiers to the Iranian Revolution – The Other Side of the Wind sees the light of day. And it is remarkably good. The plot is, despite many denials on the part of Welles, pretty autobiographical. An aging director Jake Hannaford (John Huston) is making a comeback film (also called The Other Side of the Wind). It’s incomplete and its male lead Johnny Dale (Bob Random) has apparently quit. The studio is unimpressed with the footage and you can kind of see his point. The film-within-a-film is a parodic take on such new wave cinema as Antonioni’s Zabriskie Point. A young woman (Oja Kodar) is followed by a Jim Morrison look-alike through a series of photogenic and often highly reflective settings. The obscure object of desire might be a radical. There might be a bomb. But there are lots of shots missing, and as Kenny Everett might say “all their clothes fall off”. 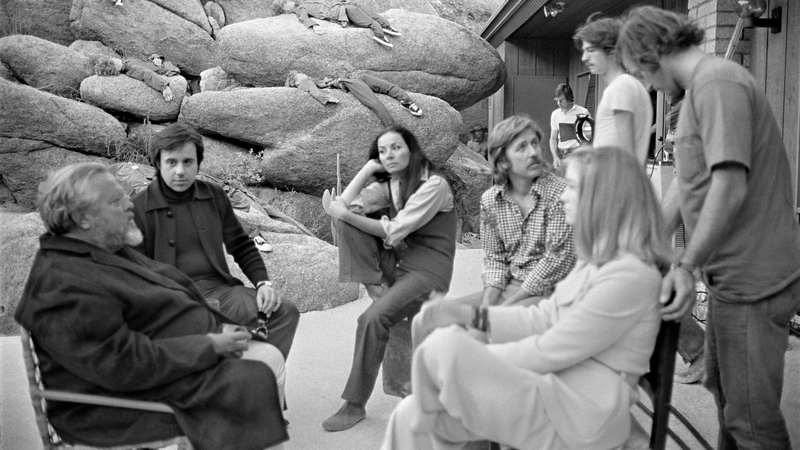 Meanwhile, Hannaford, with his longtime cronies – a Pauline Kael-like critic (Susan Strasberg), a pairing of warring young directors and a whole bunch of film students making a documentary – go over to his ranch (incidentally the one next door to the one Antonioni blew up in his film) to celebrate his birthday and get drunk, talking cinema, art and life surrounded by mannequins and cameras. The main psychodrama revolves around a young filmmaker Brooks Otterlake (Peter Bogdanovich), who was once Hannaford’s biographer but who is now a massive success. And before you ask, yes, that is exactly the relationship and the journey taken by Welles and Bogdanovich. The real world footage is a filmic melange: academy ratio (mostly), quick cuts, black and white, colour, different grades of celluloid. Technical niceties like continuity or sight lines are irrelevant. People age visibly during the party by years. In one shot, Rich Little – who was cast to play Otterlake but dropped out having filmed almost all of his scenes – appears in the role. But such mad riot is of a piece with Welles and when dwarfs turn up with fireworks, the reaction has to be: “Of course they do”. The cacophonous dialogue and the mad variety is entirely consistent with Welles’ oeuvre. Think of the initial nighttime investigation of Touch of Evil; Falstaff in his tavern; K waking up to find the police in his room; the playfulness and joyful deceit of F for Fake. From the chaos, story and character emerges, as well as genuine emotion. A longtime colleague of Hannaford, Billy (Norman Foster), will fall of the wagon during the party and Otterlake and Hannaford will have something like a final confrontation, as Hannaford is reduced to begging for help. Huston is amazing in his role – the roaring lion who knows his day is up but won’t surrender. But Bogdanovich is a revelation – a cocky wunderkind with a motormouth and Hollywood impersonations who can instantly become a needy little boy using irony as a flimsy disguise as he addresses Hannaford as “daddy”. Meanwhile, the film-within-the-film finally concludes – due to a power shortage – at a drive in, which also has to be a reference to Bogdanovich’s Targets – his first success and which also featured a dying legend meeting the new generation. In that case, classic horror icon Boris Karloff counterpoints with a modern horror, a mass shooter. The film-within-a-film is probably the most open to misinterpretation. From one point of view, it looks like a vanity project for Oja Kodar – Welles’ longtime partner and also co-writer here. But the film is supposed to be a parody – both Hannaford’s and Welles’ – they are old men trying to shove the new cinema back where it came from. The absence of story, the narcissistic posturing and voyeuristic ogling disguised as profundity are precisely what Welles is stabbing at. Whether The Other Side of the Wind will enter the Welles canon depends on how its status is accepted. Is this restored version really what Welles would have wanted? But then again so many of his films exist in a compromised or rebuilt versions – see the recent restoration of Touch of Evil for instance. So that problem also feels typically Wellesian. But watching the film as simply that, once the riot has subsided, the dust has cleared, the party is over, the rage – the very real fury – of disappointed genius comes out shockingly, this is fitting final “adios” from one of cinema’s real legendary voices. And wait until the end of the titles to hear that voice once more finally say “cut”.